The President of India, Shri Pranab Mukherjee inaugurated the Fourth Retreat of Judges of the Supreme Court at the National Judicial Academy, Bhopal today (April 16, 2016). Speaking on the occasion, the President congratulated the Chief Justice of India and other companion Judges for organizing the Retreat which will provide a forum to discuss contemporary challenges that the country faces today along with global and transnational elements of legal disputes and adjudication. He said discussion and reflection of this nature is important, as well as necessary, to enable Judges keep pace with times and be able to deliver fair and effective justice in a rapidly changing world. The President said Judiciary, which is one of the three important pillars of our democracy, is the final interpreter of the Constitution and laws. It helps in maintaining the social order by swiftly and effectively dealing with those on the wrong side of the law. As an upholder of the Rule of Law and enforcer of the right to liberty, the role of the Judiciary is sacrosanct. The faith and confidence people have reposed in the Judiciary must always be maintained. For justice to have meaning to the people, it must be accessible, affordable and quick. The President said we have a written Constitution in India, which is a living document, not a relic cast in stone. It is a magna carta of socio-economic transformation. The Apex Court of India has continuously been interpreting the mandate for good governance enshrined in the Constitution on the altar of contemporary situations and challenges facing the country, whether due to global winds of change or from within. This has not been merely an exercise in interpretation of laws or legal order, much less an exercise in edifying jurisprudence; it has captured the ethos of our developing society as it has evolved from the colonial shackles to a social order replete with the essence of human dignity, of aspirations of a populace maturing into a sovereign, socialist, secular, democratic republic as mandated by the makers of our Constitution. The President said given the circumstances of our developing country, our judiciary has enlarged the scope of justice. For the enforcement of fundamental rights, the Supreme Court through judicial innovation and activism has expanded the common law principle of ‘locus standi’. It has been made possible for courts to permit anyone with sufficient interest and acting bona fide to maintain an action for judicial redress, and to activate the judicial process. In the support of rights, courts have found a post card or newspaper article to be material enough to set-off judicial action. This has helped to bring justice closer to the common man. He emphasized that at the same time, judicial activism should not lead to the dilution of separation of powers. Each organ of our democracy must function within its own sphere and must not take over what is assigned to the others. The balance of power between the three organs of the state is enshrined in our Constitution. The Constitution is supreme. The equilibrium in the exercise of authority must be maintained at all times. The President said quick delivery of justice is sine qua non for efficient jurisprudence. Justice delayed is justice denied. Justice should be speedy, accessible and affordable. Our Courts are today overburdened on account of the large number of cases pending before them. The pendency of cases is also dependent upon the number of vacancies in the courts. He complimented the untiring efforts made by the Chief Justice of India to speedily fill up the vacancies in the High Courts and the Supreme Court. He said since the assumption of work of Collegium from the first week of January, 2016 total 145 appointments were made as on 12.4.2016. This shows the speed with which the Collegium is now functioning. He asked the Judges to continue to maintain the tempo. 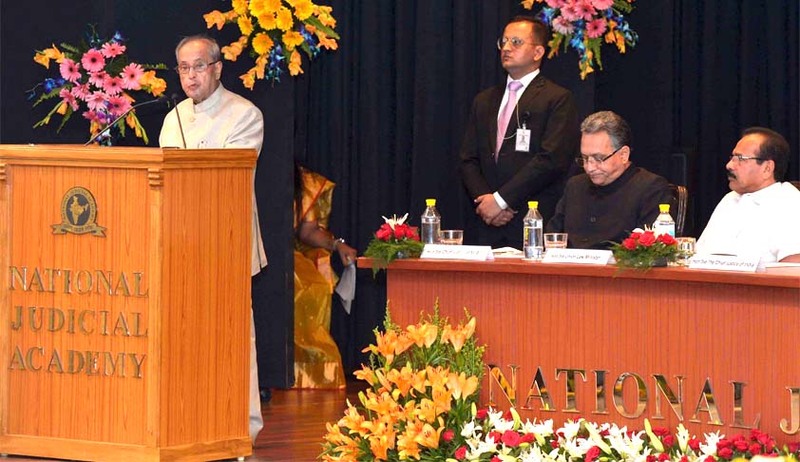 Full Text of the Speech by the President of India at the inauguration of the Fourth Retreat of Judges of the Supreme Court at National Judicial Academy, Bhopal. It is a privilege for me to be present amidst you this morning to inaugurate the Fourth Judges Retreat, 2016. I understand the first such Retreat of Supreme Court Judges was held in 2005. The Second Retreat was held in 2007 and the Third Retreat in 2009. A wide array of seminal topics, such as, impact of contemporary developments on Rule of Law, Human Rights, Administration of Justice and Judicial Systems in India were discussed in those retreats. This Retreat is happening after a gap of almost seven years. I congratulate the Hon’ble Chief Justice of India and other companion Judges for organizing such an event which will provide an open forum to discuss contemporary challenges that the country faces today along with global and transnational elements of legal disputes and adjudication. Discussion and reflection of this nature is important, as well as necessary, to enable us to keep pace with the times and be able to deliver fair and effective justice in a rapidly changing world. I hope these Retreats will be institutionalized and held regularly in the future. Judiciary, which is one of the three important pillars of our democracy, is the final interpreter of the Constitution and laws. It helps maintaining the social order by swiftly and effectively dealing with those on the wrong side of the law. As an upholder of the Rule of Law and enforcer of the right to liberty, the role of the Judiciary is sacrosanct. The faith and confidence people have reposed in the Judiciary is testimony to the fact that the Judiciary has since 1950 responded to the need of the hour. For justice to have meaning to the people, it must be accessible, affordable and quick. Maintaining “Rule of law” is the most important attribute of the judiciary in a democracy. The Constitution also recognises it and sets out the noble objective of securing justice to all the citizens of India, be it social, economical or political. In ancient times too, the rule of law had been activised and conceptualised as “Dharma-Dhru dharayate”, that is to sustain and hold together human society through norms which are moral and command the consensus of the good men in the whole community. My notion of democracy is that under it the weakest shall have the same opportunities as the strongest”. ”. Voluntary efforts by all concerned are required to make this provision a reality. Greater efforts are necessary towards legal literacy. Instilling positive values in our young lawyers is vital. The Legal Services Authorities Act was enacted in 1987 to give a statutory base to uniform legal aid programmes throughout the country. Successive Chief Justices of India have played key role in enforcing the Act and I appreciate their contribution. Provision of free legal service to the weaker sections would provide a strong impetus to the cause of ‘Justice for all’. The Apex Court of India has continuously been interpreting the mandate for good governance enshrined in the Constitution on the altar of contemporary situations and challenges facing the country, whether due to global winds of change or from within. This has not been merely an exercise in interpretation of laws or legal order, much less an exercise in edifying jurisprudence; it has captured the ethos of our developing society as it has evolved from the colonial shackles to a social order replete with the essence of human dignity, of aspirations of a populace maturing into a sovereign, socialist, secular, democratic republic as mandated by the makers of our Constitution. The Constitution of India invests our independent judiciary, especially the Apex Court with extensive jurisdiction over the acts of the legislature and the executive. Judicial review is part of the basic structure and cannot be altered even by amending the Constitution. It is the judiciary which ensures the effectiveness of Judicial Review. The independence and integrity of our judiciary is therefore of the highest importance not only to the judges but also to people at large who seek judicial redress against perceived legal injury or executive excess. Given the circumstances of our developing country, our judiciary has enlarged the scope of justice. For the enforcement of fundamental rights, the Supreme Court through judicial innovation and activism has expanded the common law principle of ‘locus standi’. It has been made possible for courts to permit anyone with sufficient interest and acting bona fideto maintain an action for judicial redress, and to activate the judicial process. In the support of rights, courts have found a post card or newspaper article to be material enough to set-off judicial action. This has helped to bring justice closer to the common man. At the same time, judicial activism should not lead to the dilution of separation of powers which is the Constitutional scheme. Each organ of our democracy must function within its own sphere and must not take over what is assigned to the others. The balance of power between the three organs of the state is enshrined in our Constitution. The Constitution is supreme. The equilibrium in the exercise of authority must be maintained at all times. The exercise of powers by the legislature and executive is subject to judicial review. However, the only check possible in the exercise of powers by the judiciary is self-imposed discipline and self-restraint by the judiciary itself. Quick delivery of justice is sine qua non for efficient jurisprudence. Justice delayed is justice denied. Justice should be speedy, accessible and affordable. Our Courts are today overburdened on account of the large number of cases pending before them. There are over three crore cases pending in various courts throughout the country. Out of these about 38.5 lakh cases are pending in 24 High Courts. The pendency of cases in the High Courts has slightly declined from 41.5 lakh in 2014 to 38.5 lakh in 2015, but we still have a long way to go. Pending cases must be quickly cleared through multi-dimensional efforts by effective use of statutory timelines and procedural norms in areas like process service, adjournments, and delivery of judgments. I am sure a paradigm shift in the way the public perceives the legal system will come through persistent efforts by Judges to clear case backlogs and reduce life cycles of cases. This must be taken as an opportunity to bring in innovation in speedy dispensation of justice. Use of IT and e-governance can make a positive impact in this regard. Basic court infrastructure has improved over the past years. ICT enablement of courts through the eCourts Project has facilitated availability of court and case data through the National Judicial Data Grid so that litigants and lawyers benefit from the availability of case information online. I hope our Courts and Judges will continue to remain active supporters as well as beneficiaries of all efforts aimed at E-governance. The pendency of cases is also dependent upon the number of vacancies in the courts. I am told that out of a sanctioned strength of 1065 judges in all the High Courts, the working strength of High Court judges throughout the country as on April 12, 2016 was only 636. This amounts to vacancy of 429 judges. Stated otherwise, our High Courts are working with about 60 per cent of the sanctioned capacity. I take this opportunity to compliment the untiring efforts made by the Chief Justice of India to speedily fill up the vacancies in the High Courts and the Supreme Court. Since the assumption of work of Collegium from the first week of January, 2016 total 145appointments were made as on 12.4.2016. This shows the speed with which the collegium is now functioning and I request Honourable Judges to maintain this tempo. Emerging nations like India are keen to incorporate international covenants and even customary international law into their municipal laws where there is no explicit contradiction. They, thereby, contribute towards the cooperation necessary and indeed inevitable, across different legal systems so as to ensure that society, the State and economy are not hampered by differences in legal systems. The inevitability of cooperation across nations and across legal systems demands understanding both from the Courts and legislature of the global village we live in. The Supreme Court of India has earned a global reputation for its superior standards and lofty ideals. Landmark judgments passed by this Court have not only strengthened the legal and constitutional framework of our country but are widely cited by the Judiciary in many other countries seeking to build progressive jurisprudence. The Bench of the Supreme Court is known for its intellectual wisdom and legal scholarship. The Supreme Court has over the years been served by Judges who have provided intellectual depth, vigour and vitality necessary to create a world-class institution. I am confident this Court will always remain a sentinel of justice. I thank you for your invitation to participate in the Retreat and formally inaugurate it.